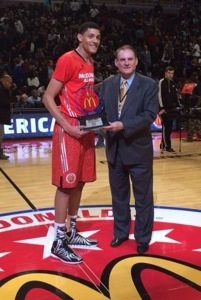 The 2014 McDonald’s All American Games will returned to Chicago on Wednesday, April 2, featuring the top 48 prep basketball players in the country. These future stars took the floor at the United Center for the 37th Annual Boys Game and 13th Annual Girls Game. Net proceeds from the Games will again benefit Ronald McDonald House Charities (RMHC). The Games have raised more than $10 million for RMHC since 1978. Both halves seem and felt identical as the West squeaked out a victory 80-78. 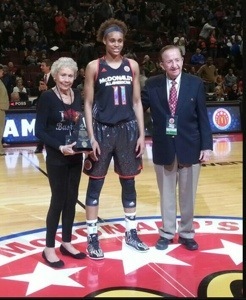 The games MVP was Notre Dame recruit Brianna Turner as she had a double-double, 10 points & 11 boards. The Notre Dame recruit, Brianna Turner, drilled a 10-foot jumper with 53 seconds left to lead the West to the 2-point victory in the girls McDonald’s All-American game. Turner, though, didn’t recall either of her game-turning plays. The UCLA-bound Canada, finished with 10 points and set a McDonald’s girls record with seven assists, trusted Turner would hit the shot. The East had a shot to tie or to win but they missed their final two attempts. One came from Florida State-bound Shakayla Thomas, who had a game-high 19 points was went in for a game tying layup was blocked by Turner, and the other came from Jatarie White, who missed a jumper with nine seconds left. Big Ten recruit, Shatrice White (Illinois), finished the game with six points, nine boards and three blocks in 18 minutes. East — Shakayla Thomas, 19 points, 4 rebounds; Lynee’ Belton (Duke), 11 points, 8 rebounds. In front of the most fans many of this years’ 2014 McDonald’s All-American Games players have ever played before, 17,116 at the United Center, these kids put on a show. In the end, it was the West on top of the East squad, 105-102. Locally speaking, the game had three Chicagoland area players: Jahlil Okafor (Whitney Young to Duke); Cliff Alexander (Curie to Kansas); and Tyler Ulis (Marian Catholic to Kentucky). Okafor, the Duke-bound center and consensus top-prospect in America, led the West with 17 points and seven boards and was named co-MVP along with North Carolina-bound forward Justin Jackson, who knocked down 23 points and grabbed 5 boards for the East. The Kentucky-bound Ulis had five points, three assists and three rebounds, while Kansas-bound Alexander had nine points, 11 rebounds and a heavily wrapped wrist he hurt in Monday night’s slam dunk contest. Known for his powerful dunks, the tape may have affected him on a pair of uncharacteristic misses. He did not practice Tuesday. There was a 1 point half time score… 50-51 and the game remained close throughout including 9 ties and 21 lead changes. Under two-minutes, the game was still tight the East made two big plays by Alexander and future Duke-recruit Tyus Jones as they took a 102-101 lead. But, shortly after that, BIG man Okafor, got the last word by throwing down a dunk to give the West the lead and sealing the victory with 38.7 seconds left. Mr. Illinois Basketball, Okafor, and Marian Catholic guard Tyler Ulis FINALLY got to play together. They spent years lobbying each other to make it happen including change AAU teams. These two spent years trying to make it happen and they finally did on a BIG stage like this, and of course, their final high school game. West — Emmanuel Mudiay, 15 points, 6 assists; Rashad Vaughn, 14 points, 5 rebounds, 2 steals. East — James Blackmon Jr., 13 points; D’Angelo Russell, 11 points. Congratulations to Justin Jackson on receiving the John Daly Sportsmanship Award. The McDonald’s All American Games alumni represent some of basketball’s greatest players, including former and current NBA and WNBA superstars: Magic Johnson (retired), Michael Jordan (retired), Alonzo Mourning (retired), LeBron James (Miami Heat), Kevin Durant (Oklahoma City Thunder), Chris Paul (Los Angeles Clippers), Derrick Rose (Chicago Bulls), Anthony Davis (New Orleans Hornets), Michael Carter-Williams (Philadelphia 76ers), Candace Parker (Los Angeles Sparks), Maya Moore (Minnesota Lynx) and Elena Delle Donne (Chicago Sky); and current college stand-outs such as: Andrew Wiggins (Kansas), Julius Randle (Kentucky), Jabari Parker (Duke), Odyssey Sims (Baylor) and Chiney Ogwumike (Stanford).